Leave the car park by following the trail sign and immediately crossing the road. You walk along a well made up gravel path, with red marked posts to guide you. There are plenty of benches for resting en route, if you need them. The walk is suitable for wheel chairs and prams. 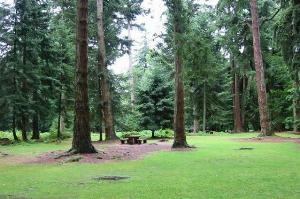 Immediately you are among tall trees and rhododendron bushes. 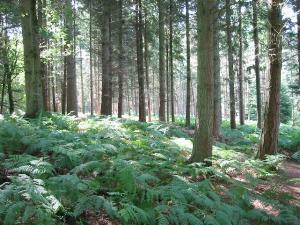 You will see diverse species of trees on this walk, many imported. The planting of this ornamental drive was completed around 1860. As you walk along parallel to the road, you will pass this example of ditch and fencing, used to prevent deer entering enclosures in years past. You soon come to the lower car park, at Blackwater. Here there are public toilets and usually an ice cream van. There are picnic tables nearby. This car park is quite busy in the summer months. 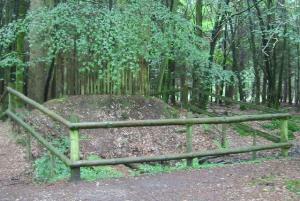 Look out for the information plaques all along the walk, giving details of trees and forestry information. 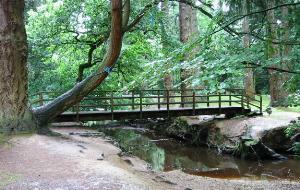 A short detour from the walk, along the road, brings you to a small river with this footbridge. The surrounding footpath is hard work as the Forestry Commission have messed it up with heavy vehicles. 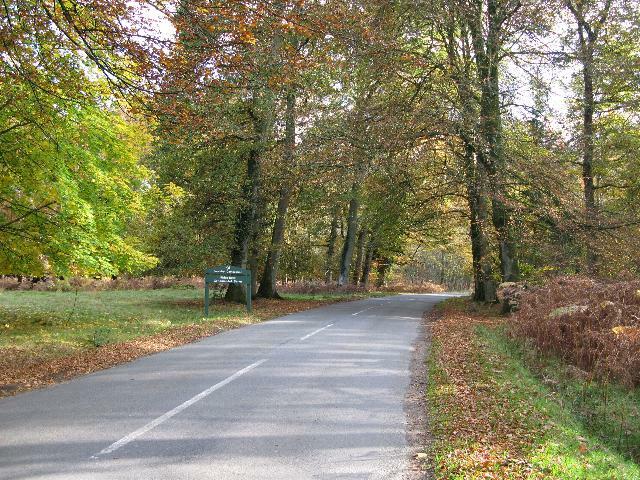 Return back and opposite the car park is a wide gravel track, with the Tall Trees Trail just 50 yards up on the right hand side. 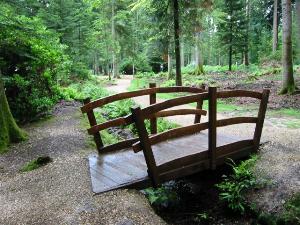 However, consider a diversion by walking straight on and visiting the arboretum. 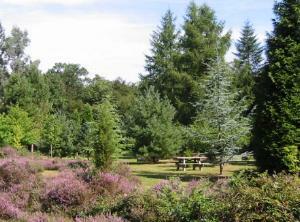 This arboretum is newly planted (compared to the rest of the walk) and has a wide variety of trees and shrubs and heathers. There are also more picnic tables and seating areas. Walk around and then return back along the track to resume your walk. Now you are walking northwards, again parallel to the road, back to the Brock Hill car park. 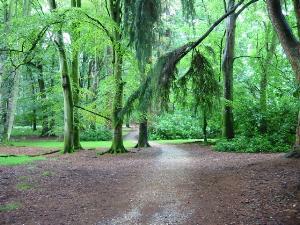 The beauty of this walk is that it is always dry under foot and because of the density and size of the trees, a cover is provided to keep you dry from any rain. 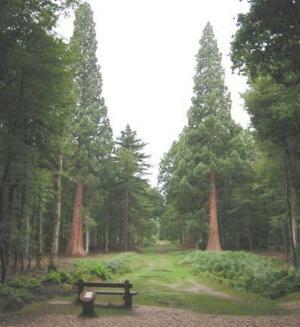 The giant Redwoods below are the tallest trees in the Forest and probably in the UK. There are grass rides off this walk and if you have more time you can explore them. 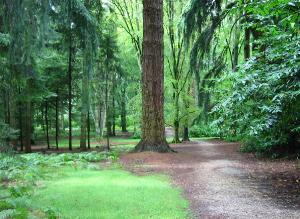 They join gravel tracks which run parallel with the Tall Trees Trail. 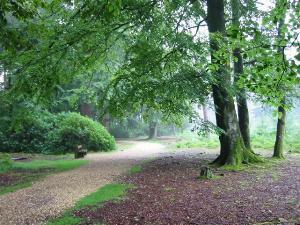 The basic walk takes around 30-40 minutes at a gentle stroll.